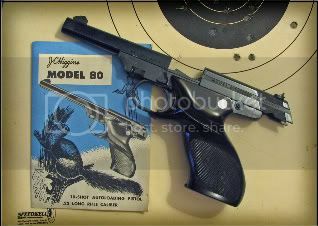 I have a JC Higgins model 80 pistol (.22 semi), in it's original box with papers. I know it was made by High Standard as a model 101, and is likely from the 1950's. That's as far as I've gotten. I'll be posting on the Carteach0 blog with lots of images as usual, but not till I can research it and be able to report something about the pistol. Last edited by Carteach0; January 10th, 2009 at 12:21 PM. Jim Spacek and Tom Dance have both written books. The Cold War wasn't that cold.